If you think it’s time to look for some career options, this article will be useful for you. Welding is an exciting and rewarding career so we’ve thought it may interest you. That’s why we’ve prepared some info about this career and the best training options available in Louisiana. 4 Where Can Certified Welders Work in Louisiana? Do you want to know what are the duties of a welder? The answer is pretty simple – metal pieces connection. To do it properly, welders use various tools that heat, melt and join metal elements. Welding – it’s not only interesting and exciting but also a rewarding career. Working as a welder, you are going to create a number of important constructions such as buildings, bridges and so on. It means that you’ll have something to be proud of. Consider the fact that welding career outlook grows daily. The U.S. Bureau of Labor Statistics claims that the number of career option will grow significantly by 2026 (by 6%). An average median salary throughout the country is $39 390 per year or $18.94 per hour. At the same time, a median welder’s salary in Louisiana earns about $47 810 annually which is about $22,99 per hour. The top 10% of welders in the USA has a salary of $62 000 per year. Speaking of the top 10% of welders in Louisiana, they earn about $69 680 or more. Where Can Certified Welders Work in Louisiana? 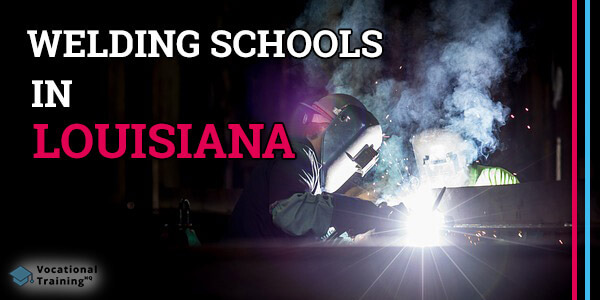 Louisiana has a number of schools that provide welding training. This article has a list of the best welding certification schools below. It’s important to say that every school in the list was approved by the American Welding Society’s SENSE Accreditation Program. Each program contains a number of important classes such as Gas Tungsten Arc Welding (TIG), Shielded Metal Arc Welding (stick), or Gas Metal Arc Welding (MIG) and so on. Speaking of the requirements you should meet it’s a high-school diploma or GED. Also, some schools accept 10th-grade students gladly. Don’t feel like becoming a welder but still looking for something similar?